This Schwaiger panic alarm is a personal security gadget. In dangerous situations, it can be used to deter possible attackers by triggering the alarm, a loud signal tone. Due to its small size, this product is the perfect companion in any situation. 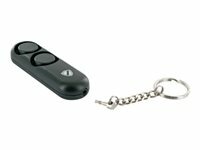 The panic alarm can for example be added to a key ring or fastened on a handbag.